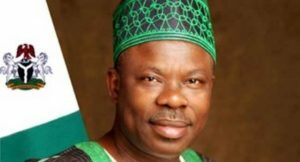 Ogun State Governor, Ibikunle Amosun, has charged members of his cabinet to brace up for greater tasks ahead, saying it required a collective efforts to deliver more dividends of democracy to the people in the New Year. Governor Amosun gave the charge at the first executive council meeting of the year held at the Exco Chamber, Governor’s office, Oke-Mosan, Abeokuta. The Governor, who prayed for a prosperous year, gave the assurance that his administration was determined to do more to surpass the achievements of the previous year, while appreciating the cabinet members for their support and dedication. He used the occasion to congratulate the outgoing Head of Service, Mr Olusola Adeyemi for his achievements and meritorious service to the State in the past 35years affirming that the Head of Service had contributed in no small measure to the success story of the present administration. Responding to the gesture of the Governor and other executive members, the Head of Service, Sola Adeyemi, appreciated the state government for the opportunity given him to serve the people of the state.